brown sugar | Some More Please! About a week ago I posed the question of what to do with a bunch of pears. Last night I looked around the kitchen and saw that I still had those pears and also some really ripe bananas. I decided to bake a pear and banana loaf. It’s really easy to put together… and the result is moist and fruity with a hint of cinnamon. My little brother is four years old and my favourite critic. He said, “It melts in my mouth” and that he “loves the crust the best”. Now that is the best compliment. This loaf is just perfect with butter for a Saturday morning breakfast. Or if you really want to impress some guests this doesn’t take long to put together. Just don’t expect it to last long! This recipe uses oil rather than butter. You can use any oil, I recommend extra virgin if you have it. Oil is actually healthier for you than butter. Whilst there are more calories per tablespoon, oil is monounsaturated fat and low in cholesterol which in the grand scheme of things is a lot better for you. Sift the flour into bowl and combine with the sugar, cinnamon and soda. Make a well in the center. In a seperate bowl whisk together the eggs, milk and oil. Fold into the flour mixture and mix until well combined (don’t beat). Gently stir in the fruit. Pour into a greased and lined loaf tin and bake for 45-50 minutes or until golden and cooked through. Cool for 5 minutes before slicing and serve. Tastes great warm or cold. I love morning teas at work. It’s the best excuse to bake something yummy. For tomorrow I baked some mini toblerone muffins! They are so cute and perfectly bite-sized. 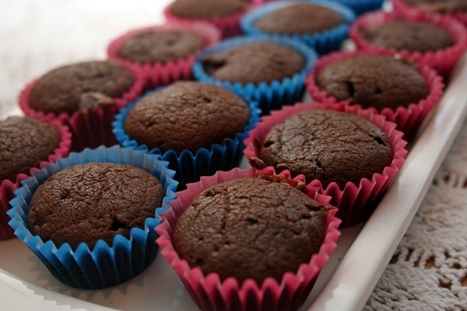 Normally I’m not really a fan of muffins… I find them quite dry but these were great! Especially a burst of creamy toblerone chocolate and nougat. Sift flour, cocoa and baking powder. Stir in sugar. Make a well in the center. Whisk together the butter, milk and egg. Pour into the flour mixture and gently stir to combine. Fold in the chopped Toblerone. Fill 3/4 of a mini muffin pan (in mini cases if you wish) and bake for 10-12 minutes. Let them cool in the pan for 5 minutes and serve straight away. Last night when I made my own shortcrust pastry I said I was in the mood for some pie. Today was the perfect weather! 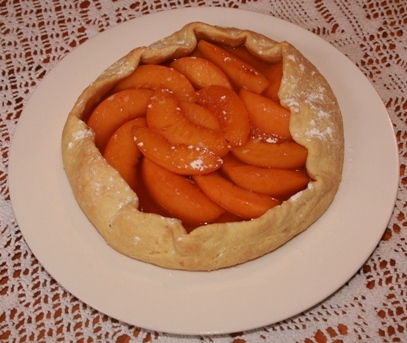 A cold, wet and dreary Sunday great for a freshly baked fruit pie. 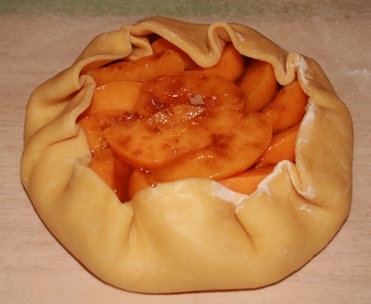 I decided to bake a free-form peach pie. Free-form means that it doesn’t use a baking tin, rather the edges are folded over to keep the filling in. I think the end result looks simple, yet really tasty and inviting. So here’s how to make your own, subsitiute the peaches for anything you fancy. Roll out the pastry until it is about as big as a dinner plate; making sure it’s all even. If you want a perfect circle you can use a plate to cut one out. Melt some apricot jam (or conserve in my case) in the microwave carefully, and spread onto the pastry leaving a border around the edge. Then sprinkle on some brown sugar. 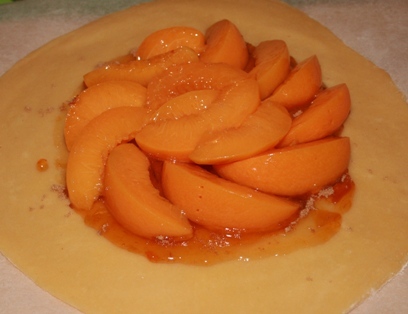 Sprinkle the peaches with more brown sugar and carefully fold the edges of the pastry to partially enclose the filling. Now it’s ready to be baked! Sprinkle with icing sugar and serve! The smell is divine; warm stewed peaches, I couldn’t wait to eat it. Serve a slice with some double cream and try not to eat the whole pie! I am so incredibly proud of this dessert; it’s the first time I have ever made my own shortcrust pastry and it turned out light and crispy just as I hoped. And here is the recipe! 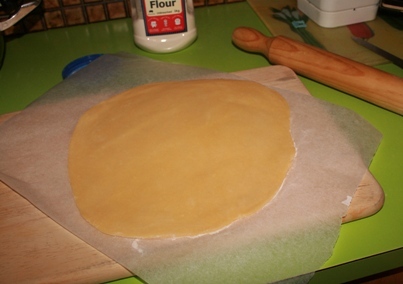 Roll out the pastry into a rough circle shape as big as a dinner plate. Melt the apricot jam in either a saucepan or the microwave. Spread onto the pastry leaving a 2cm border around the edge. Sprinkle with 1tbs of the brown sugar. 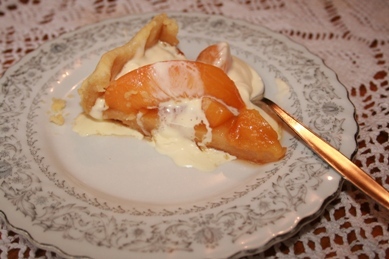 Arrange the peaches on the pastry. 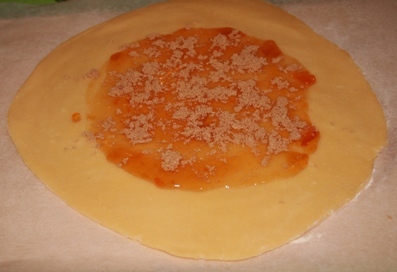 Sprinkle with the remaining sugar and carefully fold the edges of the pastry partially enclosing the filling. Place the pie on a baking paper lined tray and bake for 25 minutes or until golden. Let it cool slightly and serve!